We are the leading manufacturer and supplier of Pellet Vibrating Sieve. These products are widely used in Chemical and Pharmaceutical Industries. 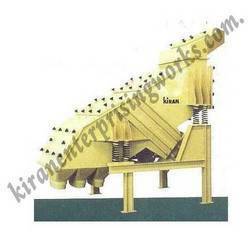 We ensure high performance and less maintenance cost of these Vibrating Sieves. The product in the inlet of the sieve comes leveled on all-the width material is evenly distributed across these screens by means of a static distributor adjustable from the exterior. The robust casing is constructed in 3 mm mild steel with lateral reinforcement. It is mounted on 8 "soft" springs ensuring all dynamic vibration is transferred to the sieving action. The screens are easy to change from the back of the machine. The mechanical action of the is made by one vibration motors, positioned below the body of the sieve giving easy-access to the counterbalances. Looking for Pellet Vibrating Sieve ?